Three Vikings Walk Into a Spaceship… Praise Odin for nostalgia. The Lost Vikings is a welcome trip through Blizzard’s time capsule. Last November at Blizzcon it was announced there would be a new unit for the upcoming Heroes of the Storm MOBA. Their names are Baleog, Olaf, and Erik the Swift. 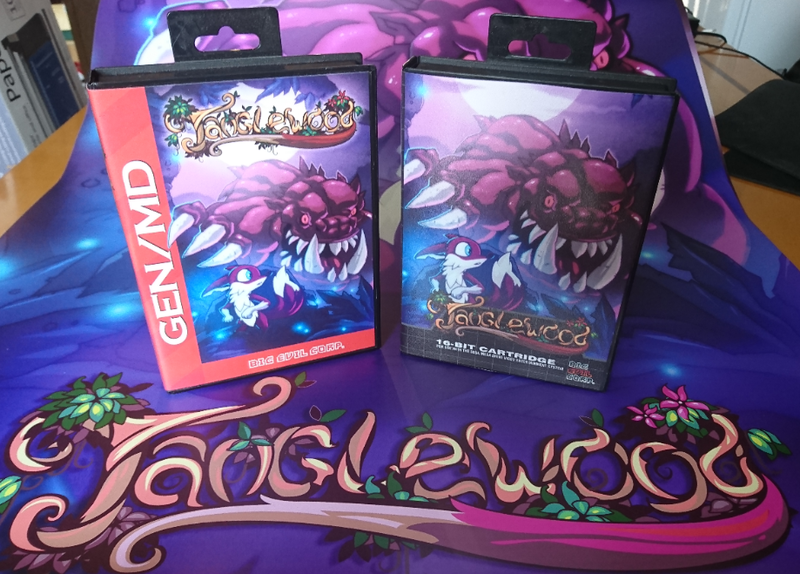 For newer Blizzard fans, these characters may be unknown, but for those of growing up in the 16-bit era these characters are collectively known as The Lost Vikings. 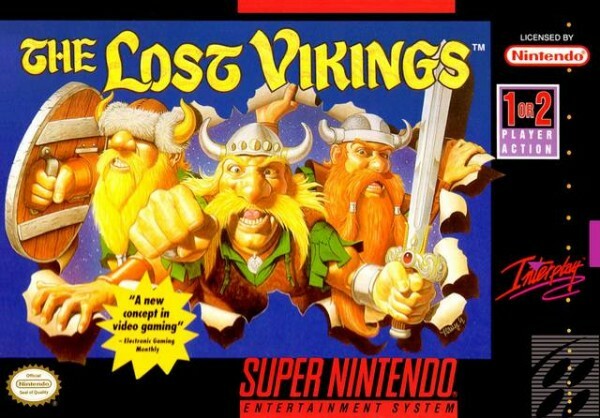 The Lost Vikings was the one of the first original titles developed by Blizzard, then called Silicon & Synapse. 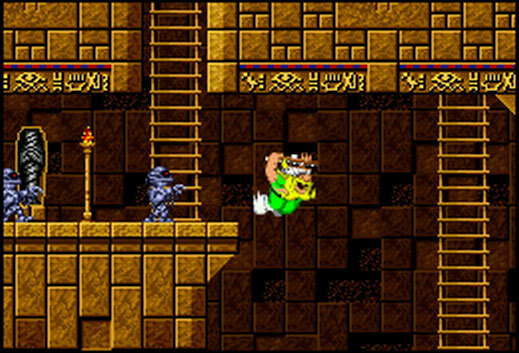 The game is described as a puzzle/platformer title but that doesn’t quite describe the gameplay. You play as all three vikings each with a unique ability. Baleog can attack each enemy with a sword and bow, Olaf has a shield to defend from attacks and slow your fall, and Erik the swift can run fast, jump, and smash certain walls with his head. 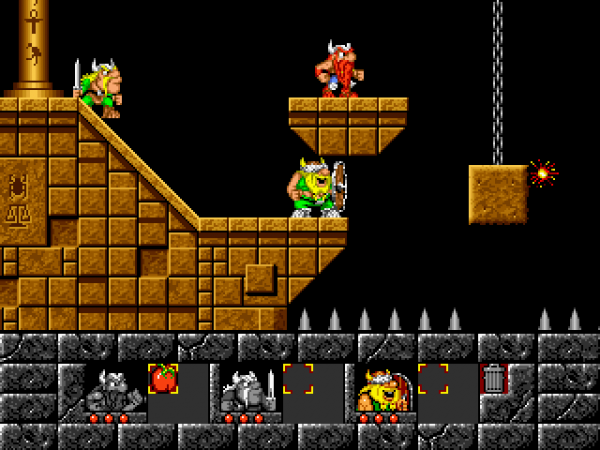 Each section of the levels requires you to use each viking’s ability to get you from point A to point B. You can switch between each viking with the L and R buttons, and in order to finish the level you need to get all three vikings to the exit. The story has a level of depth literature fanatics will go bananas over. One day all three of the vikings were out hunting and then aliens came along and captured them to put them on their species display. The aliens, or “Croutonians,” do a terrible job keeping the vikings in their ship and you warp around from world to world trying to get home. The level design has a bit of variety to it. You’ll fight cavemen, dinosaurs, pharaohs, scorpions, and more through caves, pyramids, volcanoes, spaceships, and other odd places for Norsemen. Each level is basically just different colored platforms but you’ll climb trees, ladders, and even inflate your vikings to get past some of the sections. The Lost Vikings requires a level of patience beyond what you’d expect from a 16-bit era platformer. It has a dynamic I’m surprised wasn’t used much in games to follow. The only other game I can compare it to is the Mario Bros pie game in Game & Watch Gallery 3 for Game Boy Color. It’s a silly comparison considering that game was basically Tapper if you had two bartenders. 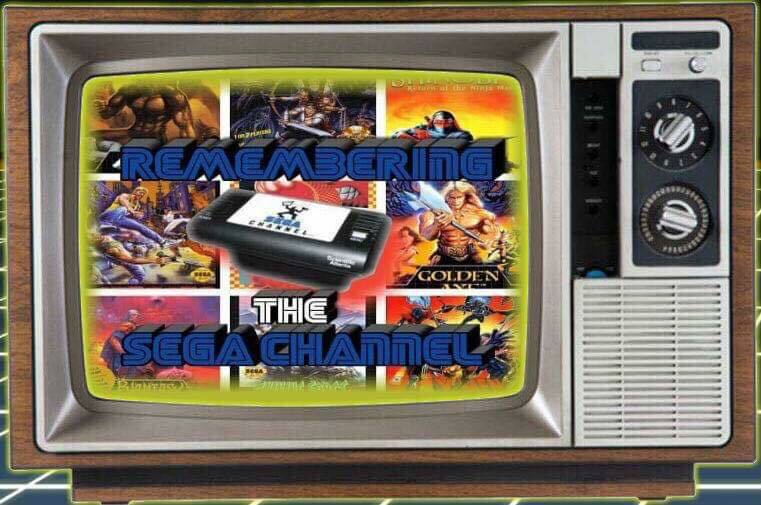 I don’t remember how well I did renting this as a kid, but I’m guessing I didn’t get anywhere near as far as I did this play through. 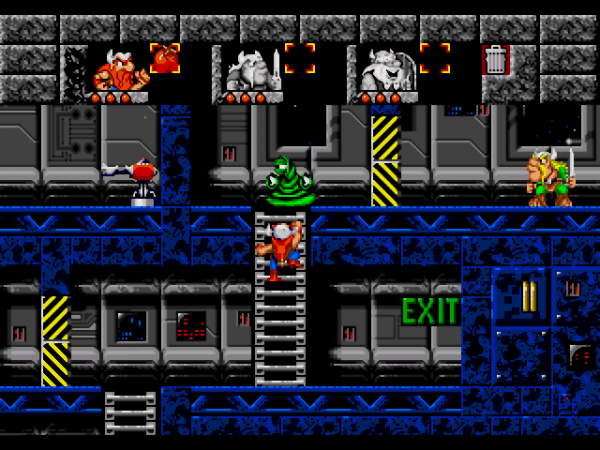 The game requires a lot of trial and error to figure out the puzzles and even the platforming works that way in the later levels. There’s no way to look through the entirety of the level so each section went something like this: Move Olaf the shield guy forward, move everyone else a little bit, kill the enemies, run into a section you can’t see past, die, realize how you were supposed to do it, start over and try again. It’s extra frustrating because for some reason the level doesn’t end when one of your vikings dies, but if you reach the end of the level with one or two of them left you end up at the continue screen anyway. During the pyramid levels you can climb trees to get across quicksand. 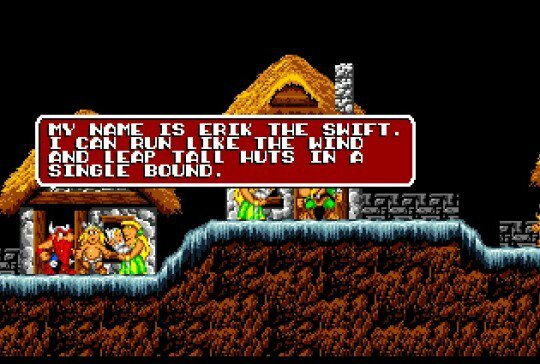 I didn’t know this, however, so I spent a few long-winded attempts by using Erik the jumping Norwegian to try and find the item or bridge to unlock. Eventually, I figured out the climbing thing. You can get to the top of the tree and simply move forward to land across the quicksand…theoretically. This didn’t work the first few tries and I eventually figured it out by chance. Basically, if you mess up even a little you have to start all over and it takes a lot of deep breaths to move forward. The Lost Vikings makes up for its frustration with a lot of ambition. For the limitations presented by that era it certainly set itself apart. The puzzles are more challenging to execute than to figure out which is somehow rewarding. Racking your brain is one thing and hacking and slashing is another. This settles in its own comfort zone where you’re not doing too much of either. The Lost Vikings has a lot of personality but it feels pretty dated. It’s like a streamlined version of Lemmings if Lemmings took elements from Ghouls and Ghosts. There are tons of levels to play through and the passwords are simple enough that you can remember them and get back to where you were. I played the game on the SNES but if you can hunt it down the Sega Genesis version has five more levels. The Lost Vikings can be a lot of fun and will definitely show you how Blizzard became known for their world building and strategy games. The visuals are charming in a cartoony sense and the music is great despite being one track per world. 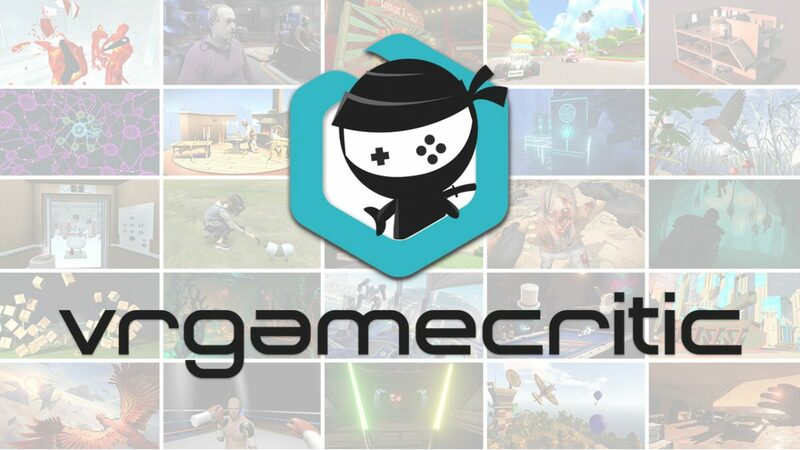 It would take a bit of nostalgia to really want to play through this title but considering it’s free on Battle.net now you can check out a great start to a now legendary developer.